Carri Weber hates white men. 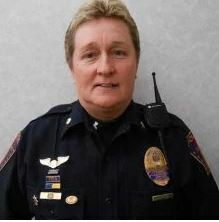 An Indiana police force placed a female captain on paid administrative leave after she told a fellow officer that he benefited from “white male privilege.” A vote on Capt. Carri Weber’s future with the Plainfield Police Department is scheduled for a commissioner’s meeting on Thursday, according to WRTV. The incident occurred at a Nov. 1 training seminar on how police should interact with transgender people in their communities, led by a U.S. Department of Justice representative and a United States attorney.